bakergoodchild has put together a list of common myths and misconceptions surrounding the outsourcing of print management to prove that they are exactly that, and therefore should not prevent companies from outsourcing their printing requirements. Responding to each of these in turn, bakergoodchild has issued the following information. With regards to a client fearing that their print requirements will not be met, bakergoodchild tailors its print management services to meet client’s specific requirements, ensuring that it can always meet their needs, no matter how specific. In fact, they advise companies to outline their exact needs in their service level agreement, then if a print company can’t meet your needs, you have the right to reject it. In response to the myth that print costs will rise, bakergoodchild feels that outsourcing work can often work out to be far more cost effective, as it saves the need for investing in expensive print equipment and staff. Additionally, they also advise to ensure that costs are added up correctly, as many companies often fail to include the cost of staff time and energy, which can often result in-house printing looking cheaper than it actually is. Any fears that print quality will suffer from outsourcing, bakergoodchild feels that print management companies will have better access to the right equipment for the job, providing an improved consistency with a more centralised operation and additionally print companies wont pass on low quality work to clients. As far as management time and administration increasing, again this has been debunked. By using one supplier there will be just one invoice for all consumables, maintenance and printing, which of course will all be managed, allowing staff to focus on their core business duties and not having to manage the printing work. 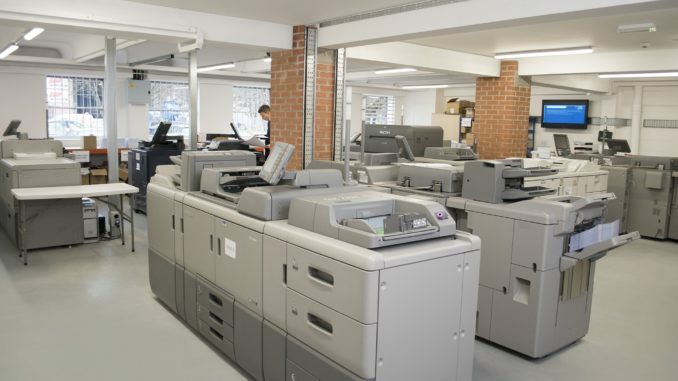 Far from there being an increase in print lead-times, the print company will be using the latest technology so rapid print volumes will be achieved, there will be less downtime along with a higher print capability. At the same time the print management company will also be used to managing large quantities of print jobs, so there will be no issues with them not being able to handle print volumes. Stock levels can also be held and negotiated with the print management company, and possible time savings could be made through improved communication channels. And as for making the company less agile and responsive, by outsourcing there will be less wastage and improved efficiency, the latest technology will be available so event the most demanding of requests can be met, and with less employees involved in the chain of command, agility of the company will increase. Furthermore, volume demands, even at peak periods will allow an improved availability in staffing levels. So, according to bakergoodchild, who are experts in this field, that’s the seven most common myths surrounding the outsourcing of print management completely debunked!